Boy do I feel accomplished when I’m able to squeeze the last drop out of a product. And once again I have an overflowing pile of garbage that I save in a corner of my room to share with you guys (still…almost two years later Corey can’t understand this). I love reading these posts from other bloggers to see what they liked enough to use up completely, as well as whether or not the products are worth re-purchasing. I’m a sucker for a good empties post. And because of that these are some of my favourite posts to share with you guys. So lets delve into the pile of garbage…..
For the first time in quite awhile I have a few makeup items in the pile. After cracking my Rimmel Stay Matte Powder on my way home from Mexico a few months ago, it was only a short time later that the remaining few crumbs spilled out everywhere and were no longer usable. I absolutely loved this powder and wonder why I purchased a completely different powder to try out rather than replacing this one. It’s definitely one of my favourites. I also finished two liquid eyeliners – the Lancome Artliner as well as the Kat Von D Tattoo Liner. I absolutely love the Kat Von D liner and have already, and always will, repurchase. My favourite of all time. The Lacome Artliner was great, but I struggle with the brush – too delicate. I end up with two uneven wobbly lines. 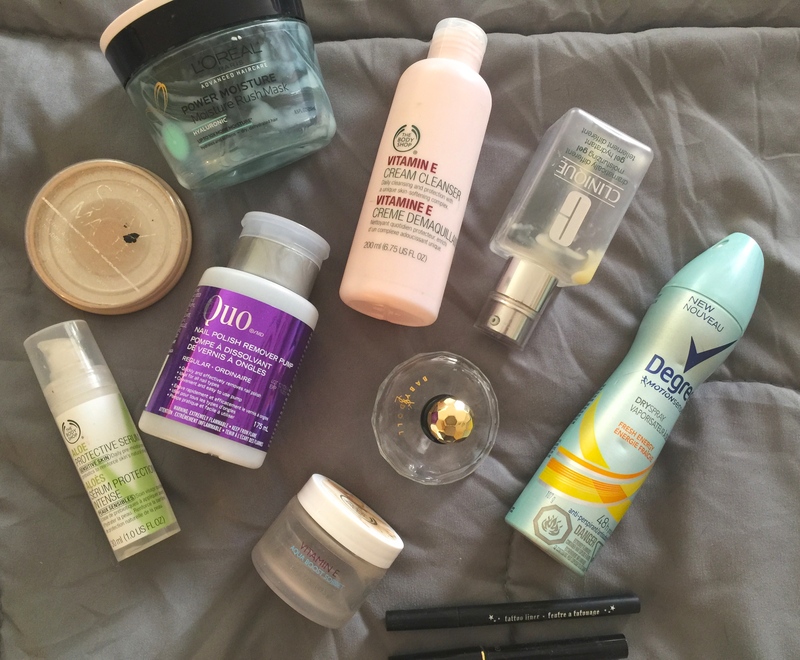 Moving on to the mass of beauty products, I didn’t bother including the regular empty bottle of Catwalk Curl Amplifying Cream that makes an appearance in every empties post, but there were a few new ones. L’Oreal’s Power Rush Moisture Mask for hair was amazing and lasted a long time. Smells great and makes my hair so soft. Definite repurchase. For my face we have a few Body Shop items including the Vitamin E Aqua Boost Sorbet, my all-time favourite day cream. We also have the Vitamin E Cream Cleanser which I liked, but didn’t love. I prefer lathering face washes. As we all know I ADORE the Vitamin E line from TBS. I also finished up the Aloe Protective Serum, which I will most likely repurchase. I think it’s a great serum for the summer months. And finally, the last face product was my longest running repurchase item: the Clinique Dramatically Different Moisturizing Gel, which I will repurchase the moment I see any sign of the bottom. Ever. Single. Night. Two last (and random) products. Quo’s Nail Polish Remover Pump has been the best remover i’ve tried in a long time. So easy to use and takes all polish off quick! I’ve already repurchased. A really old YSL Babydoll perfume was finally spritzed to the last drop – it’s about time. And lastly, Degree’s Motionsense Dry Spray anti-perpirant in Fresh Energy. I picked this up to see what I felt about the new ‘dry spray’ fad, and wasn’t quite sold. It took a few days to get the correct balance and how much was required, and on a daily bases I felt like I was breathing in deodorant fumes. Not pleasant. I’ll stick to my wind-up sticks thanks. What have you used up lately? Have you tried any of these?